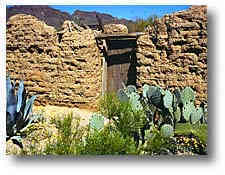 You Are Listening To "Arizona Moon"
Old Tucson, originally built in 1939 as a set for the movie, "Arizona", lived on for many years to come. 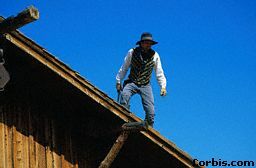 The buildings are constructed of weathered adobe and weathered boards, giving the appearance of stepping back in time. 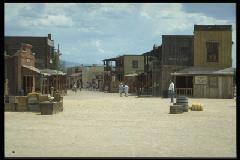 Many more movies were made here, including John Wayne's "Rio Lobo", "Gunfight At The OK Corral", "Three Amigos", and others. 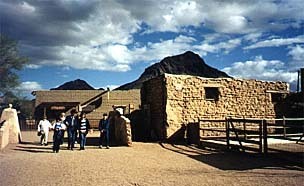 TV series such as Gunsmoke and High Chapparal were also filmed here. 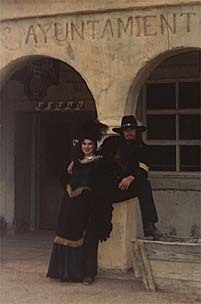 As you take a stroll back in time, you may be caught in the middle of a simulated, old-fashioned gunfight. 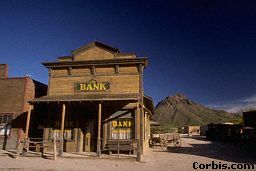 This old bank didn't stand a chance when arsonists set fire to Old Tucson on April 25, 1995. Many of the buildings and memorabilia were lost. It was closed for almost two years, but has been rebuilt and looks just like it did before the fire. 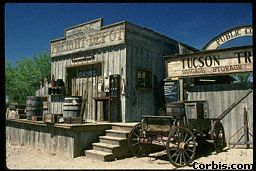 Without even being aware of it, if you have ever seen a John Wayne movie, you have probably visited Old Tucson. Believe me, there is nothing like visiting it in person. Taking a break between shows, Diamond Lil chats with a local cowpoke. 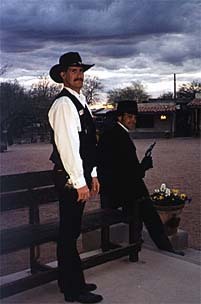 Local lawmen keep the peace in Old Tucson. It's a peaceful town, podner! This is a portion of the High Chapparal movie and TV set. Are you hungry? 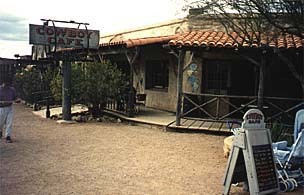 Hearty southwestern meals are served at the Cowboy Cafe. I guess it's time to move on....wait, what's that up ahead? 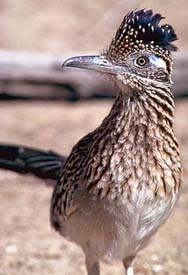 It's Arizona's most endearing bird - the Roadrunner. Yep, they really do exist outside cartoons. It is almost two feet long, unusual for a desert bird. They are lively and inquisitive. If frightened, or if they just want to move on, they flatten themselves and run like the wind. (They do not go beep beep). They seldom fly and, in fact, can only do so for short distances. This is the University of Arizona. 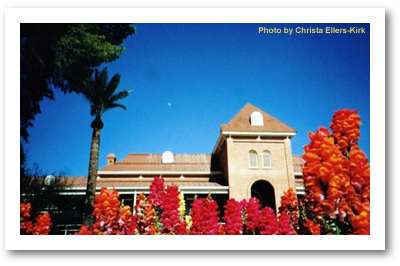 Located in the heart of Tucson, it sits on 352 acres. 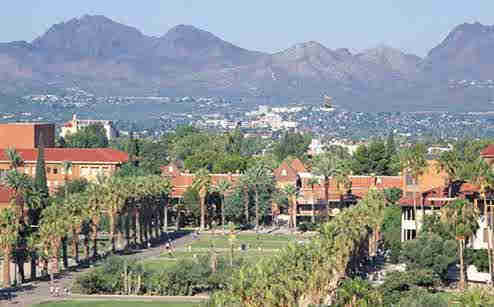 U. of AZ. is one of the top ranked research institutions in America. Surrounded by mountains and the high Sonoran Desert, the University of Arizona is home to over 35,000 students coming from all 50 states and over 100 foreign countries. That was a short 100 miles west, wasn't it? Aren't you glad we had A/C put in this old Chevy? Here we are at Organ Pipe Cactus National Monument. 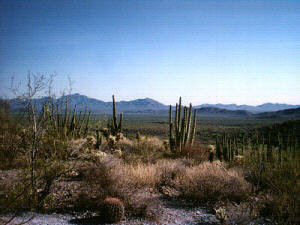 This National Monument celebrates the life and landscape of the Sonoran Desert. Here, in this desert wilderness, you can drive a lonely road, hike a backcountry trail or camp beneath the clear desert sky. 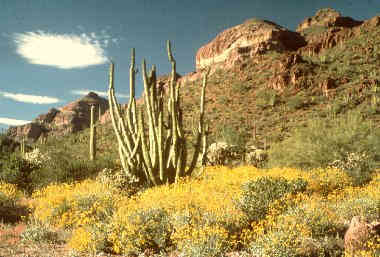 Organ Pipe Cactus National Monument exhibits an extraordinary collection of plants including the Organ Pipe Cactus, itself. 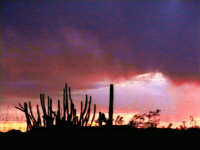 The Organ Pipe Cactus is a large cactus rarely found in the United States, but common in Mexico. (By the way, we're just about 20 miles from the Mexican border here). It's a sun and heat lover and grows best on southern slopes. 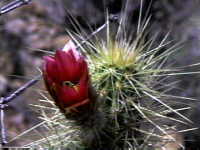 Look at the lovely red blossom on this Prickly Pear Cactus. The desert comes alive with color in the spring. Everyone back aboard. We're going to head north toward Tempe and Phoenix, the capital of Arizona. 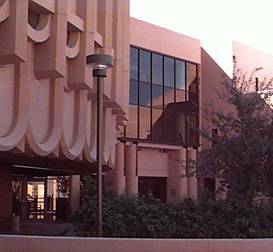 This is the main entrance to Arizona State University located in Tempe, Arizona. 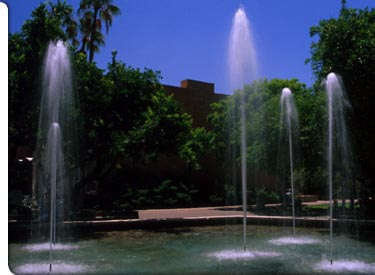 ASU is an internationally known metropolitan research institution serving approximately 47,000 students on three campuses. Let's go a short distance to Phoenix, the capital city of Arizona. It's a very short drive to Phoenix. Just click on the license plate, and we'll be there!